No. 2 Notre Dame seeks to move past its first loss of the season and turn its focus toward its matchup against No. 3 North Carolina on Friday. The Irish (4-1-1, 1-0 ACC) fell to Xavier, 1-0, on Tuesday at Alumni Stadium, their first loss since Virginia ended their season last year in the third round of the NCAA tournament. Despite that blemish on its record, Irish head coach Bobby Clark said his team understands the implications this matchup carries far outweigh what it’s worth to dwell on the loss. “This is the biggest game in the collegiate calendar this week,” Clark said. “Currently, if you go by Monday’s ranking, we’re No. 2, and they’re No.3. We might not be two after Tuesday’s loss, but it’s still a big ACC match, a national match. It’s a good test to go to a place like Fetzer Field and play a game there. It’s a challenge good teams love, and this will be a test. Junior defenseman Matt Habrowski readies a pass in a 1-0 loss to Xaiver on Sept. 15 at Alumni Stadium. The Tar Heels (4-0-1, ACC 1-0), unlike the Irish, last played a game week ago against Virginia Tech, so Clark said he expects they’ll be well rested. Clark said while it’s going to be tough to play on such a quick turnaround, his players will be more than ready to approach the challenge head-on. North Carolina advanced to the quarterfinals of the NCAA tournament last season before losing to UCLA on penalty kicks. The Tar Heels ranked as the country’s highest scoring offense, accumulating the most goals and points nationally as well as the third-most assists by the end of the season. This season, North Carolina is currently tied for 39th in offense, scoring 1.8 goals per contest, which is well below where it finished a season ago. Regardless, it is ranked the third-best team in the country, and Clark said this is going to be one of the biggest challenges of the season. While the Irish would rather forget what happened against Xavier, some of the players said they think there are things they can learn from that loss that can be used to beat North Carolina. 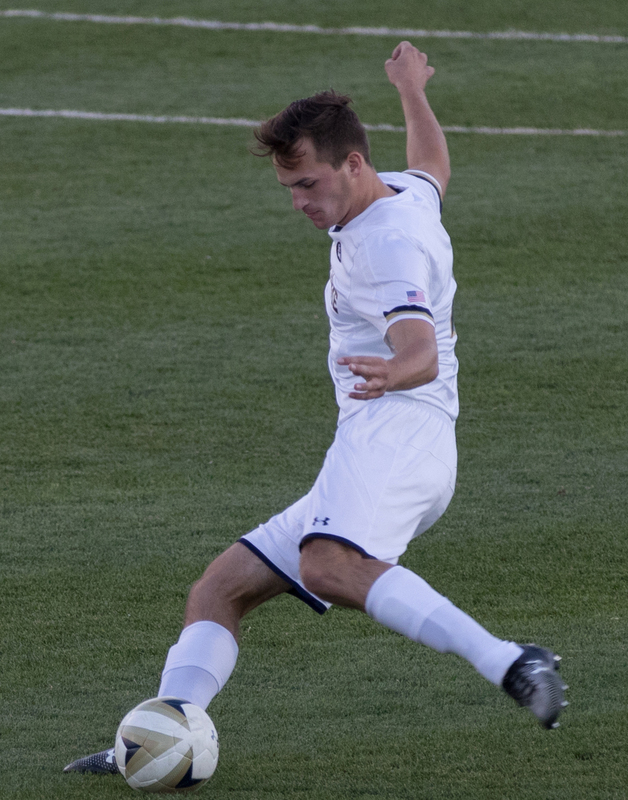 Senior midfielder Evan Panken fights for a loose ball during a 1-0 loss to Xavier on Sept. 15 at Alumni Stadium. 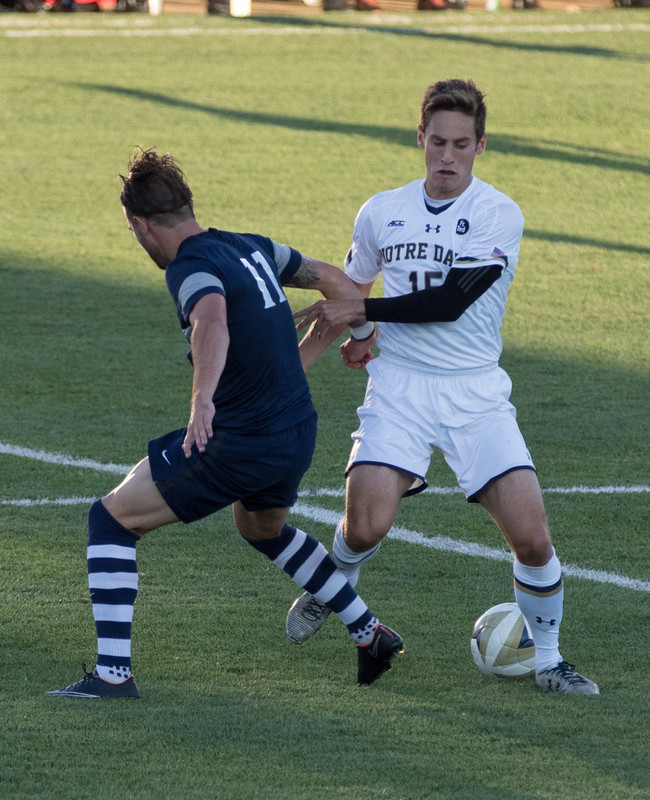 Against Xavier, Panken led the Irish with three shots on goal but failed to convert any of them into scores. So far this season, North Carolina has allowed two goals combined. They conceded one goal against William & Mary and Tulsa and have shut out the other three opponents they’ve faced. Of note is the fact ESPNU has decided to broadcast the game, the only regular season ACC matchup the network has decided to broadcast this season. Despite the national coverage, Notre Dame is confident its players won’t fall victim to the nerves that come along with playing in such a high-profile game. The Irish will kick off their matchup against the Tar Heels on Friday at 5 p.m. at Fetzer Field in Chapel Hill, North Carolina.